Should You Buy A Video Doorbell? Peephole or video doorbell? It’s the classic debate over low-tech versus high-tech. A basic peephole gets the job done with little fuss. 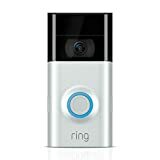 But a video doorbell with WiFi capabilities might be the answer for those who can’t be bothered to get off the couch or want to see who’s at the door when no one’s home. On the downside, it only works when the homeowner is on the other side of the door peering through. Even then, the view typically comes with fish-eye distortion and a limited field of vision. Peepholes have been around as long as strangers have been knocking on doors. Visit a historic place like Colonial Williamsburg, Virginia, and you’ll see peepholes with a swinging cover built into doors at eye level. This was before high-strength glass became widely available. Back then, a peephole was literally nothing more than a hole drilled in the door with a sliding metal plate covering the aperture from the inside. Fast-forward a few centuries to the WiFi video doorbell, which consists of a ringer and a camera that mounts over the door. The camera transmits a signal linked to an app, typically on a smartphone. When someone rings and you hear the doorbell sound, the camera activates and turns on the app. Presto: Whoever’s at the door appears on your phone screen, tablet or computer monitor. You can talk to the visitor on your end and hear what they have to say over the camera’s built-in microphone. You can also tell deliverymen where to leave packages or even scare off would-be burglars without coming to the door. All this convenience in a high-tech package comes at a price – at least $100. More expensive models feature cameras that deliver better picture and sound. Some are battery-operated. Others connect to doorbell voltage wiring and come with a battery backup. Pricier packages come with multiple cameras for front and back doors, over the garage, almost anywhere you want to surveil, Drengenberg says. Motion sensors on some models activate the camera whenever someone approaches. They’ll even record video, which can be saved automatically to a hard drive inside the house. The sensors also notify the homeowner on a smartphone app. Consider the strength of your WiFi signal when shopping for a WiFi-enabled video doorbell. A weak signal will be harder to receive through walls. Another thing: When you’re away from home, you’ll have to use your phone’s data plan to interact with the doorbell camera. The most expensive systems come with an Ethernet port to run a cable from the camera to an Internet router inside the home. That way, the Wi-Fi signal transmits completely indoors from the router to a smartphone or tablet and doesn’t have to penetrate an exterior wall. Anyone reasonably skilled with hand tools and looking for a home improvement project should be able to install a doorbell camera, says Drengenberg, an electrical engineer with decades of experience. Renters should ask their landlord if it’s okay to drill holes in an exterior wall or door-frame to install the hardware before they get started. A decent doorbell camera could provide added peace of mind over reliance on a peephole alone. If you do stick with a basic peephole, make sure you pick the safest one. UL runs tests on peephole strength. Products that pass muster display the UL approval label. UL also evaluates video doorbells. Before buying security electronics like video doorbells, Drengenberg encourages consumers to look for the UL approval label on the packaging. Steve Evans, a former reporter for SNL Financial and the Richmond Times-Dispatch, writes about insurance for MoneyGeek.com.